Amina Tashmukhamedovna Smailova - is a family doctor, pediatric doctor. In 2014 she graduated with honors from KAZMU named after Asfendiyarov with a degree in General Medicine. In 2013, she studied the basics of evidence-based medicine and management in Barcelona. From 2014 to 2016, she completed an internship in the specialty doctor-pediatrician. In 2018, she completed a two-year study and practice in the specialty “Family Doctor”. Currently, she is practicing as an infectious diseases doctor, family doctor, and pediatrician. She has been a volunteer doctor. She speaks Russian, Kazakh, and English. Abunasyr Sadykov - family doctor. In 2000 he graduated from KazNMU named after S.D. Asfendiyarov specialty "medical business". In 2001 he passed internship in general medical practice. During his studies and after them he worked in a team of family doctors from the USA in Kazakhstan. Then he worked in the field of clinical pharmacology. Conducts constant monitoring of all family members with a different spectrum of diseases. Regularly participates in medical conferences and advanced training courses both in Kazakhstan and abroad. In 2015, he completed a master’s degree in KIMEP with a degree in Business Administration for Management Personnel. 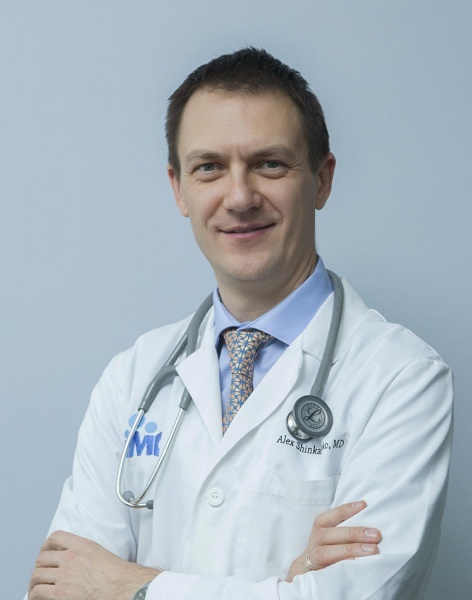 Abunasyr Sadykov is a member of the Kazakhstan Association of Family Doctors and the European Organization of Family Doctors (Wonca Europe). Dr. Alexander Shinkarenko attended Almaty Medical School and later got a three-year residency training in Family Medicine in Tulsa, OK (USA). After graduating from residency in 2008 he completed a one year fellowship in Faculty development in the USA before coming back to Kazakhstan. 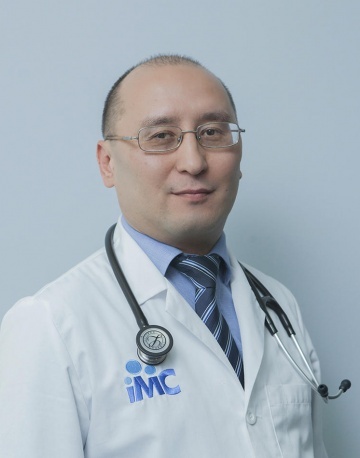 Dr Shinkarenko is US Board of Family Medicine certified and is a member of American Academy of Family Physicians as well as Association of Family Doctors in Kazakhstan. He maintains his Oklahoma State medical license and stays current with continuous medical education, regularly attending International trainings and conferences overseas. He enjoys Family medicine for its variety and constant need to keep the skills and knowledge up to date. 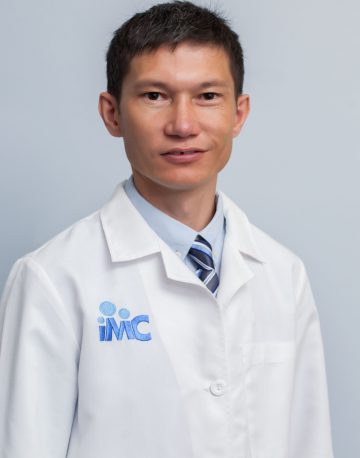 Dr. Shinkarenko is also the Director of IMC. Dr. Dmitry Kireev graduated from Kazakh State Medical University (KazSMU) in 2010 and then completed internship in Family Medicine. Dr. Kireev is KTAI (Kinesio Taping Association International) certified specialist. He is also licensed in Sports medicine and medical rehabilitation. He practices full scope of Family medicine. He regularly maintains his professional level by participating in continuous medical education trainings in Kazakhstan and overseas. Dr. Kireev is a triathlete, ultra runner and three times Ironman. 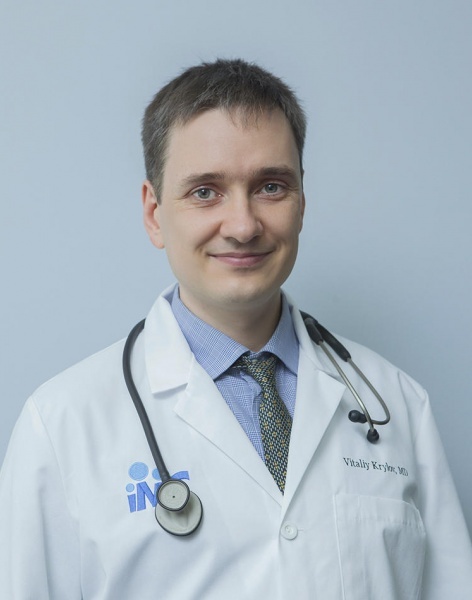 Dr. Vitaly Krylov graduated from Kazakhstan National Medical University in 2005 and has been working in our clinic since its opening in 2006. In 2015 - 2018 he got a three-year residency training in Family Medicine in Tulsa, OK (USA) and worked as a family doctor in the USA, before he returned to Kazakhstan. Dr. Krylov is US Board of Family Medicine certified and is a member of American Academy of Family Physicians as well as Association of Family Doctors in Kazakhstan. 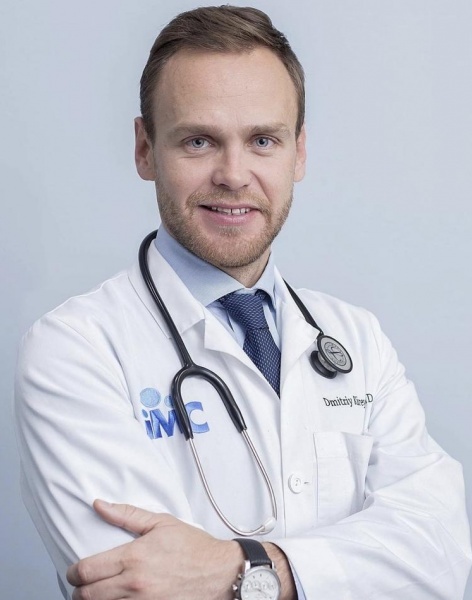 He maintains his Oklahoma State medical license and stays current with continuous medical education, regularly attending International trainings and conferences overseas, as well as regularly undergo advanced training courses in Kazakhstan, and participates in international conferences and trainings. Yelena Khegay is a family physician from Kazakhstan. She graduated from Kazakh National Medical University in 2007 with honors, and completed her 2-year GP residency program in 2010. For several years she has worked as a Project Coordinator, and later as a Study Investigator at Kazakhstan Association of Family Physicians (KAFP). Since 2014 Yelena is back to clinical practice and has been working as a general practitioner and a Teaching Assistant at a postgraduate family medicine faculty. Currently she is studying MPH Program at Kazakhstan School of Public Health. Her special fields of interest are domestic violence, mental health issues and quality improvement in primary care. Yelena has been actively involved into KAFP activities on health literacy improvement and healthy life style promotion among general population and healthcare workers - through social media and on personal basis as well. Yelena sees her mission in improving health care services and promotion of Health for All in Kazakhstan. 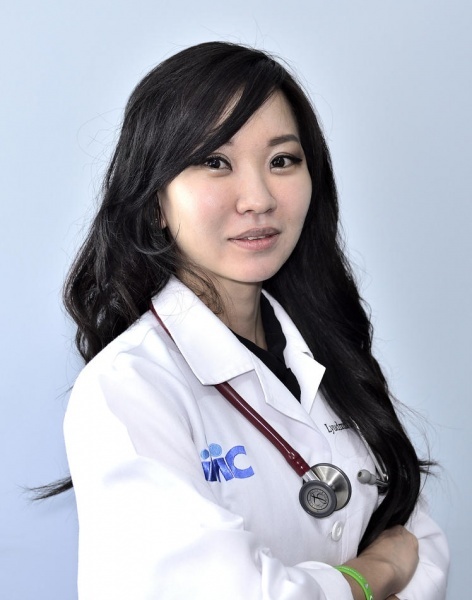 She is a head of a young doctor’s organization in her home country, and Kazakhstani National representative to the Europe Council of the Vasco da Gama Movement (the youth branch of Wonca Europe (the European Organization of Family Physicians). Serik Maratovich Konyrbayev graduated from the medical faculty of KazNMU and completed an internship in Family Medicine. He began working at the International Medical Center in 2017, accepting adults and children. He speaks Russian, Kazakh and English. Patients love Serik Maratovich for competence and goodwill. He enthusiastically follows the latest data in the field of diagnosis and treatment, constantly improving his knowledge. Serik Maratovich is married and has 2 children. 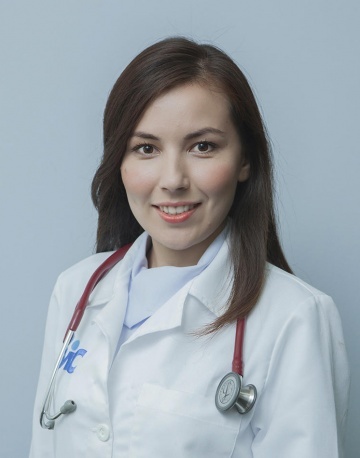 Lyudmila Petrovna Nam received medical education at the Pediatric Faculty of the Almaty State Medical Institute. Since 1980 worked as a pediatrician. In 2004 retrained in family medicine at the department of the Institute of Advanced Medical Studies. 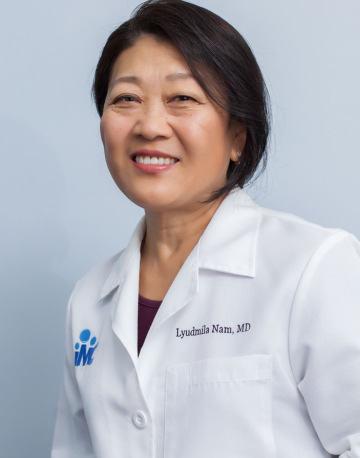 She has been working as a family doctor at the International Medical Center since 2005. She seeks to achieve not only physical recovery, but also the emotional and psychological well-being of patients. To this end, Lyudmila Petrovna was trained in family counseling at the University of Bonn (Germany) and the University of Navarre (Spain), as well as in Psychosomatics and psychotherapy at the Kazakh State Medical University. She regularly takes courses in advanced training and participates in international medical conferences. 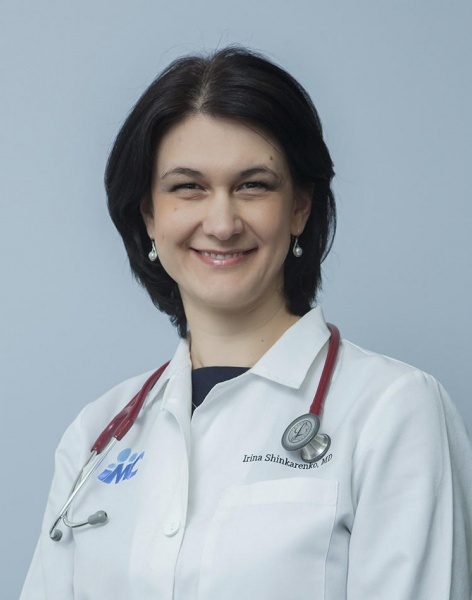 Dr Irina Shinkarenko completed her medical degree at the Almaty Medical School in 1999 and went on to finish a three-year Family Medicine Residency program in Tulsa, OK (USA). She practiced medicine for an additional year in the USA before returning to Kazakhstan. Dr. Shinkarenko is Board certified by the American Board of Family Medicine and she is a member of American Academy of Family Physicians. She maintains both an Oklahoma State medical license and a Kazakhstani medical license. She is trying to stay current by participating in continuous medical education activities and International medical conferences.